This page recently recieved a Four-Star Review from the McKinley Group, overseers of the Magellan Web Search Service. Ilan Salzberg: Introductory material, formal and thematic analyses, methodology, commentary. Jeremy Sheff: Editing, Web research and links, Site design, programming. Robert Sheridan: Monet's biography and an overview of Impressionism. You are visitor number since March 4, 1996. Congratulations. This page is best viewed with Netscape Navigator 2.0. Download it Now! An introduction to Monet and this site. A biography of the artist. A discussion of Monet's methods and techniques. A formal analysis of one of Monet's works. A thematic analysis of the same work. A bibliography of sources used to create this site. A sampling of the Poplars series. Some of the famous Water Lilies, at SunSite UNC's WebMuseum. Here are some sites which provided us with images and information. 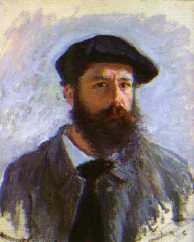 They are of interest to anyone seeking more online information on Monet. Howard Yen's Cyberspace Gallery, which provided not only images and background but exce llent example HTML code. Old Reliable, SunSite UNC's WebMuseum. Special thanks and appreciation to Howard Yen, Bradley J. Baker, and WebMuseum. These pages are maintained by Jeremy Sheff. Please send any comments or suggestions to [email protected].